The "Take It!" 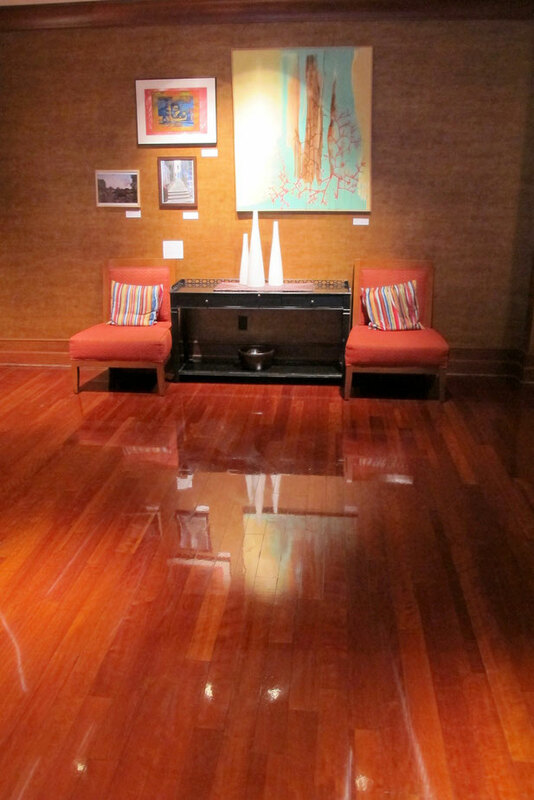 came from watching one of the maintence people at this hotel doing what is a part of his early morning job, waxing and maintaining the wood floor in the lobby of the hotel in which he works. It is by great luck I have had the chance to not only witness the wood floor being installed, but also to watch the maintence routine be put into place and kept clean. The fellow that has had this responsibility for all these years is a very pleasant immigrant from Vietnam. He speaks very little and although he is not a large fellow, he handles a giant buffer like it is an extension of himself. He applies wax from a spray bottle in the trafficked locations and wherever else it may need a touching up. Watching him do his work is a pleasure as he shows pride in his work and his work shows this pride in its luster. He finishes well enough before the hustle and bustle of guests fill the area with their busy coming and goings. It is all a part of the atmosphere that has many coming back to enjoy this seemingly simple, but ever so splendid contribution to a stay or even brief visit. The After Take: I have over the course of time and through pantomime expressions shown to this maestro my respect for his work. Whenever I am there early enough to catch him bringing about the mirror on the floor finish, I make certain to give him either a wave or a bow. Occasionally, I will come in when I am very early and it is still dark outside wearing my sun glasses feigning that the reflection is just too bright for me to take without my shades. He gives a whoop at this and we invariably shake hands. A most enjoyable occasion; all done without much at all in the way of spoken words. Here is hoping you have a certain someplace or something that shines and makes you happy in seeing it glow. If there is a way to seek out the person that brings about that brightness, please do, and let them know you see how great they are at this ever so important talent. For this, you will both glow and it will show. Thanks for joining us for the current photo presentation. You are cordially invited to return Tuesday April 17 for a new picture that we hope you will enjoy. Ok I need to hire this guy to come over after the holidays. hahahaha, ya he does good work. The old saying you could eat off that floor really shines here.